f Can you tell we love those cheap egg dishes? 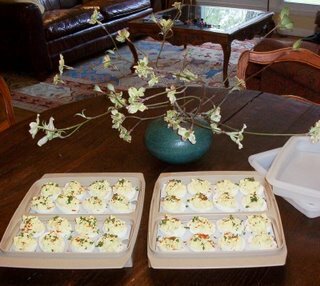 I made stuffed (or deviled) eggs my specialty as a young bride. My husband, then youth director at a small church, had lots of potluck on the calendar. I found that I could prepare a huge tray of stuffed eggs for under $2. My aunts all teased me, showing up to every family function with yet ANOTHER platter...yet laugh as they did, the eggs would be among the first foods to disappear. Now I keep them on hand as a low-carb protein snack for my husband, substituting homemade yogurt for mayonnaise to cut down on the fat. Leave it to vintage Tupperware to make storing stuffed eggs easy: these egg keepers are the only lidded container that won't smush the filling. Otherwise, I like to arrange them on a bed of lettuce in a flat basket, garnishing each half with paprika and minced parsley. Publix advertised a deli stuffed egg platter for $16 this week--but each carton of 12 raw eggs costs only 69 cents. When you make stuffed eggs at home, you are saving a bundle! I would like to find one of those Tupperware egg-carriers. Handy, dandy. Is it hard to make homemade yogurt? Do you need any special do-me-doggies? Wow!! What kind of trays are you using here? Looks good and yummy. I think I will be adding an egg carrier to my car boot searches for vintage Tuperware! What a great idea. At our house, every Easter, Christmas, and New Year's Day must have devilled eggs. We put sliced green olives instead of parsley on top. Do you put mayo (or yogurt), mustard, and pickle relish in your egg yolk mixture? I never realized it was THAT cheap. Yes, Devilled eggs is the first dish to go at any potluck that has them. And they are actually very easy to make the last time I had to take a breakfast dish I found out. Those Tupperware containers? Also great for brownies and cookies. We RARELY used it for eggs. The one I have doesn't even have egg plates, but I still consider it a must-have piece for the kitchen. My mother makes the best deviled eggs. Her secret ingredient, believe it or not, is a pinch of sugar. I think it offsets the vinegar. I've never heard them called 'stuffed eggs,' LOL! #1, I can't believe you did all this preparation while preggo! Oh my word, you must be absolutely EXHAUSTED! As for Lady Laura's question on the yogurt-there is a really good tutorial on Hillbilly Housewife that tells you various methods of making it with stuff you should already have. I haven't yet tried it, but it is one of the next efforts on my own personal "try it then blog about it" quest. Her entire recipe section is pretty good if you haven't checked it out! When son #1 was little he called them "doubled eggs", and was HORRIFIED when I told him they were "deviled"...so *doubled eggs* has stuck. BTW, GREAT GREAT GREAT dogwood/vintage (VanBriggle?) arrangement in the photo. M: Consider publishing your devil egg recipe? Thank you, Debbie. I use the sugar free pickle relish--to me, the sweet is a must. Pickles are one of the few SF foods I can eat without the unpleasant side effects--most use Splenda alone to sweeten, not malitol. Even good SF relish is so cheap, you'd have to have a few rows of pickling cucumbers to make your own cost-effective. My basic filling mixture is mayonnaise (or yogurt for home use), a squirt of yellow mustard, plenty of salt and pepper, a teaspoon of Worcestershire sauce (a hint from Miss Daisy), sweet relish squeezed to remove extra juice---oh, and paprika on top for decoration. Parsley if I have it. I don't really measure anymore, but the eggs always taste good anyway. My husband is also diabetic. We really don't like the taste of Splenda, but keep trying. he uses S&L in his coffee but reading about excitotoxins keeps us trying for a different source. Have you ever used whey sweetener? I ordered some whey sweeteners that taste very 'real' and are not chemically derived, just don't see much published EVER about using them. Another friend here makes phenomenal zucchini relish, you know how plentiful zuc is late summer...i think i will try some of it in the devils.